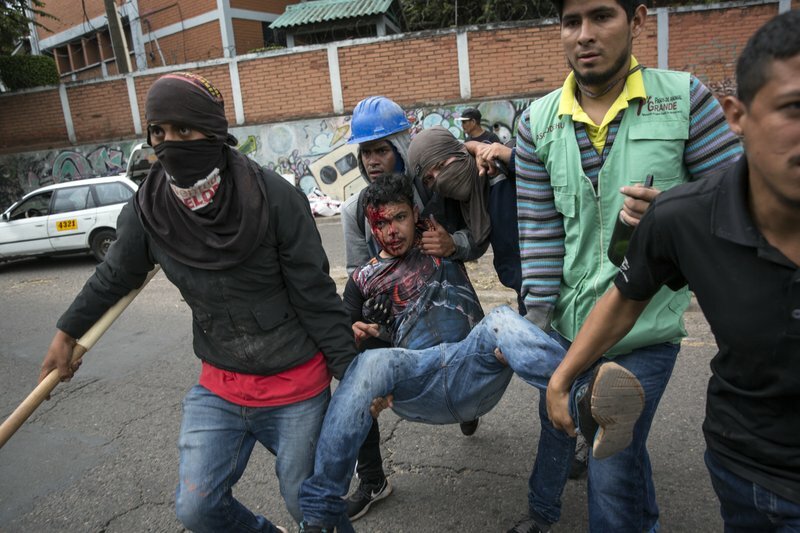 TEGUCIGALPA, Honduras (AP) — Protesters and police clashed violently Thursday as incumbent President Juan Orlando Hernandez emerged with a growing lead for re-election following a reported computer glitch that shut down vote counting for several hours. Thursday night, Hernandez was ahead by more than 45,000 votes with nearly 93 percent of Sunday’s votes processed. He had 42.9 percent of the vote to Nasralla’s 41.4 percent. Opposition supporters protested throughout the day and into the night outside the electoral court’s facilities and on major boulevards, setting up roadblocks and lighting bonfires in the streets. Hooded demonstrators threw rocks and pieces of wood at riot police carrying batons and shields, who responded forcefully with tear gas and water cannons as calls to maintain calm were increasingly unheeded. Honduras’ influential Private Business Council urged the electoral court to wait until all the votes are counted before announcing the result. Across the country, columns of smoke rose from tires set ablaze in the streets. In Tegucigalpa, protesters and riot police faced off amid billowing clouds of gas. Officers with batons and tear gas closed two central boulevards, and water cannons were deployed for crowd control. At least four people were admitted to the University School Hospital with injuries to the head and neck. Red Cross workers also attended to people in the streets, including one young protester bleeding profusely from the head. In the northern municipality of Santa Rita, police reported that two officers and a member of the military were injured by opposition protesters. “We will be on guard all night,” said Lastenia Figueroa, an office worker who took part in the demonstrations in Tegucigalpa. The Public Safety Department warned that it would “peacefully clear out the protesters because they are blocking traffic.” It reported more disturbances in at least eight cities besides the capital. Former President Manuel Zelaya, whose Libre party was part of Nasralla’s coalition, called for international observers to organize a public count of ballots to alleviate concerns of manipulation. He spoke on Honduras’ Canal 5 television Thursday. 0 Response to "Protests grow as vote count in Honduras drags on"